You've seen that cover and thought to yourself, "What is wrong with that girl?" I thought the same thing and that is exactly why I wanted to read this book. We meet Taylor as she is checking into a psychiatric facility after a failed runaway attempt. As you can guess, Taylor isn't too thrilled about being there. Even though she was absolutely miserable living with her alcoholic mother, home was better than this place. She gets on the wrong side of some female patients and just when she is at her breaking point, she befriends a feisty girl named Margo. I liked Margo and it took me a bit to try to figure out her character. I didn't know if she was going to go all Girl Interrupted on me. She was a bit of a comedic break in this sometimes gut wrenching story. Without Margo's friendship, I'm not sure how Taylor would have gotten through some of the rough times in that place. Taylor is Seminole and every now and then she would reflect back on her father's wisdom and the stories and songs her grandmother would tell her. I thought about my own daughters, they are Osage, and wondered if this is something they did. Although Taylor has a different story than me and my girls, there is something familiar about Taylor's journey that we can all relate to. We all look for acceptance and love from our family. We all want to feel like we matter and are worth sacrificing things for. When it comes down to it, we all just want to be loved. When Taylor needs to get down to business and really start therapy, I felt for the girl. I wanted to tell her it would all be okay - that nothing was her fault. I couldn't blame her for just wanting to runaway from it all, including her feelings. Her journey will easily win the hearts over young readers. Counting Backwards has the right balance of heartbreak, growth, and self discovery. It's like going to therapy without the expensive bill. Everyone will learn a little something about themselves. Check out the banner on the left side bar for the rest of the tour stops. 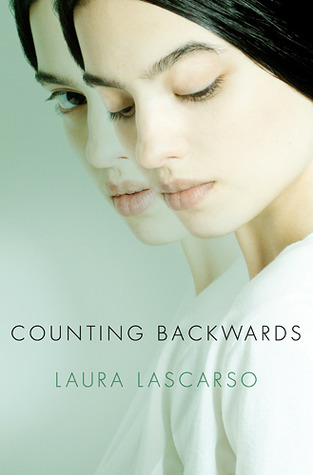 I'm happy to have Lascarso on the blog chatting about her debut! Before we go into the story, we have got to talk about that cover! I remember finding it on Goodreads last December and thinking to myself, “That girl looks ca-ree-py!” Can you tell us a little bit about the cover art process and your opinion? Totally. The cover is creepy because, wait, now she's looking at you, now she's not. But seriously, the Atheneum team did an amazing job. The model is beautiful and expressive and so true to the character that now I can't think about Taylor without picturing her, which is pretty crazy. And the double image is such a metaphor for Taylor's personality in what she chooses to reveal, even to herself. What came first; plot, character, or setting? Definitely character first, then setting, then over and over again, plot. I wanted to use the setting of Sunny Meadows to push Taylor to her limits, a place that for anyone else, might not be so bad, but for her, is a very hard adjustment, in part because it deprives her of her coping mechanism, which is to run away from her problems. For instance, the time-out rooms are these ultra pristine holding cells where you can do nothing but think, which is kind of like the ultimate punishment for Taylor, so yes, Sunny Meadows is a labyrinth designed especially for her. Describe your publication journey in three words (or less). When I’m not writing, I _________. Hang out with family and friends, catch up on my shows, and read, read, read! We learn early on that Taylor is Seminole. Why create a Native character? Why Seminole? I was reading Betty Mae Jumper's autobiography around the time of Taylor's inception. I think that influenced me in the way real life works its way into books. Betty Mae was such an amazing woman, who led such a multi-faceted life. While writing CB, I kind of imagined her as Taylor's grandmother. Taylor finds herself in psychiatric care after a failed runaway attempt. What was the most difficult scene to write? I would say it wasn't one scene, necessarily, but it was striking the right balance of emotion throughout. I wanted high highs and low lows, but also with some levity. I didn't want Taylor to be too whiny or acerbic, but I wanted her to be jaded and distrustful, so it was a balancing act throughout, and one that I had to work at. To put it lightly, Taylor is reluctant to the therapy process. Did you hope to dispel the stigma that therapy is shameful and for loonies? I didn't go into it consciously to dispel the stigma, though I did hope to make the process very personal. I wanted to portray therapy in an honest light, that is, it's not easy or fun, but with the right therapist--someone you trust and with whom there is mutual respect--therapy can be incredibly beneficial. I don't think there is anything wrong with being guarded in therapy, especially given Taylor's past, but at the same time, that protective barrier also shuts out people who could potentially help her. That's her struggle, I think. Taylor meets a boy with his own issues. How hard was it to not have their relationship be picture perfect? I think that for their relationship to have been picture perfect, it would have struck the reader as false or superficial. They each had to unpack their own baggage and not necessarily at the same pace or even with each other. I wanted AJ to challenge Taylor throughout, because I think those relationships are most satisfying in the end. There was a change I made around draft four, at the suggestion of my critique partner, which made AJ more directly involved in Taylor's plan of action. That breakdown and eventual rebuild was very satisfying for me to write and I think parallels Taylor's overall journey nicely. Pizza at my favorite pizza place with my favorite people. Can you fill us in on what you are working on now? A YA novel of love and obsession. It's a complete manuscript that is being shopped around to editors. It's not a traditional love story, so it may be a harder sell, but hopefully, it will find a home. I love Texas! I once lost my transmission in Austin, in a place the locals called Tumbleweed Hill--my car was a Floridian, used to the flat terrain. Anyway, I spent a week camping on the Colorado River with my boyfriend (now husband) while we waited for the car to get fixed and it was amazing. People were so friendly! Also, Big Bend--talk about plant diversity and unexpected flash floods (with hail)! Texas is such an adventure and I would love to come back for a visit. Lucky for you, there is a copy of Counting Backwards up for grabs! US only. Fill out the fancy doo-hickey below to be officially entered. Good luck!